We'll use the latest computer-aided design technology to design your new bathroom down to the smallest detail. Once the design has been approved, we prepare a firm and final proposal that we will honor no matter what the surprises that may await when demolition begins. And we've seen plenty of surprises! D-Day (That's D for Demolition). so that you can plan accordingly. On demolition day we'll start early in the morning, laying down tarps and moving furniture out of harms way. 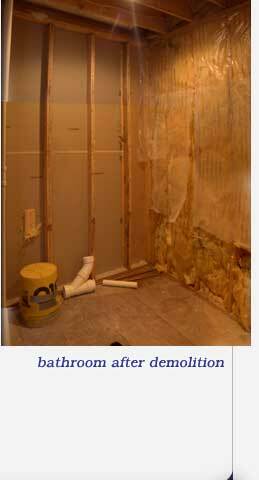 We won't kid you, demolition is a messy business, but please be assured that we take this intrusion seriously and do everything possible to minimize our impact on your home, belongings, and sanity. By the end of the first day demolition will be complete and the area tidy. We don't ever leave the site until we have personally vacuumed and dusted all rooms adjoining the work area.